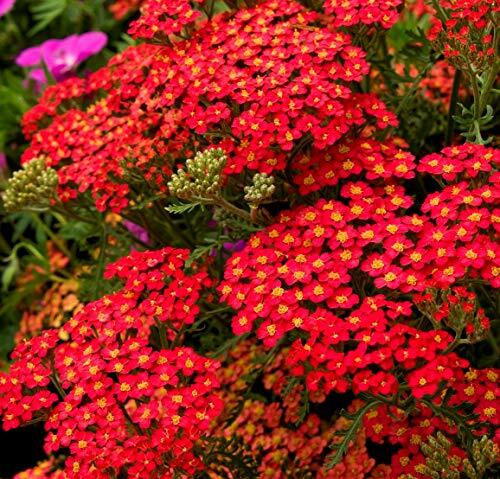 An herbaceous, mat forming perennial growing to 3FT, depending on the specific variety or sub species. || Foliage remains low with most of the height obtained from the long flower stalks. The green-grey leaves are 9″ long with a bipinnate or tripinnate form and are covered in small hairs, which accentuate the feathery appearance of the foliage. The leaves at the base and up to the middle are the largest and they are arranged in a spiral around the stem. Sow the seeds into cells or pots containing good quality seed compost. Sow on the surface and do not cover, as light aids germination of seeds.Water from the base of the tray. Place in a propagator or warm place, ideally at 70°F. Keep the compost moist but not wet at all times. Germination takes 5 to 10 days. Prick out each seedling once it has its first set of “true” leaves, transplant into 3in pots or trays to grow on. Gradually acclimatise to outdoor conditions for 10 to 15 days before planting out after all risk of frost has passed. Transplant to full sun and light soil; if the soil is rich, the stems get floppy. Plant 12 to 24″ apart. This entry was posted in stem cell information and tagged 16000, bin206, grow, Herb, Homeopathy, Perennial, Seeds, Stunning, Wildflower, Yarrow. Bookmark the permalink.